Cards Keeper is the awesome turn-based card action game in which you will take on mystical creatures within the hidden dungeons surrounding you. You are a brave hero on a mission to rid the land of these creatures and you must do so by winning using the card battle system. This is a turn-based battle system so plan your moves and tactics accordingly. To make sure that you win the duel. 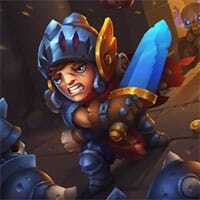 As you progress you will earn rewards which will upgrade your hero to make their abilities even stronger. You can also buy other characters with even more increased power levels. Good luck!